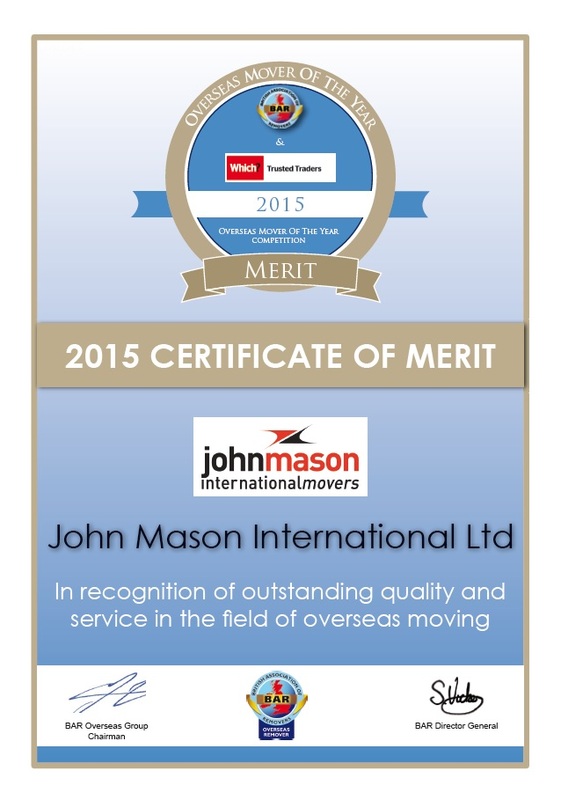 John Mason International have received a Certificate of Merit from the British Association of Removers (BAR) in recognition of outstanding quality and service in the field of overseas moving. The BAR & Which? Trusted Trader Overseas Mover of the Year competition focuses on the customer experience and evaluates the whole international moving process from start to finish. It was launched this year at the BAR Conference in Belfast. BAR is the UK’s leading Trade Association for the removals industry. The organisation aims to promote best practice and professional standards in the industry. The BAR Overseas Group is a sub group of BAR which is dedicated to promoting professional excellence to providers of international moving services. All BAR Overseas Group members have an annual inspection to make sure that quality standards are constantly maintained.